I didn’t know this, but gold wedding bands – the circle of everlasting love – do not last quite as long we might think, according to a recent study. A chemist in Vienna (who obviously has a lot of time on his hands) calculated just how much gold from wedding bands scrapes against, and off, the skin on a weekly basis, how quickly this happens and at what cost. The chemist, whose name is Steinhauser, called his study ‘Quantification of the Abrasive Wear of a Gold Wedding Ring’ (for those of you interested enough, you can download the entire study somewhere on the internet) and weighed his newly married gold wedding band on a weekly basis over a year. He worked out that the ring lost an average of .12mg of gold a week. 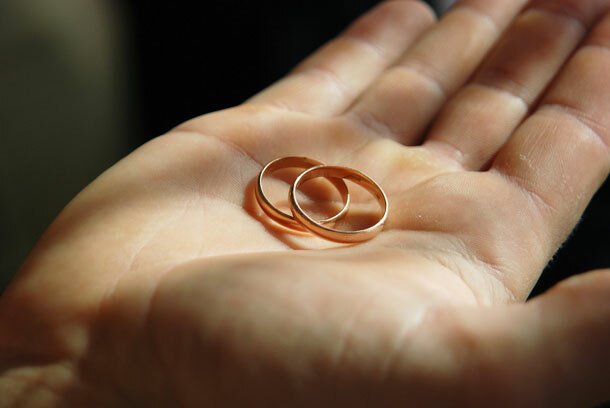 He went a little further to calculate that in the city of Vienna, which has roughly 300 000 married couples, the rings together lose roughly 2.2kg of 18-carat gold every year, worth roughly 35 000 euros. Of course there is a more serious side to the study, particularly for scientists, who Steinhauser urges not to wear gold rings whilst in analytical laboratories dedicated to analysing traces of metals, as the gold on their skin that has been in contact with the ring will possibly contaminate the study. But there’s a lovely element to the story too. Despite the obvious ‘loss’ of gold due to abrasion of metal particles, it seems that human fingers leave traces of gold everywhere. We’re rather like fairy godmothers who sprinkle gold dust in the process of casting a spell – only ours are minuscule particles that leave no obvious trace. Or maybe they do. Perhaps our delicate traces of gold spread goodwill and love in their wake? Despite a wedding band’s symbolism of permanence, bits of it disappear as the marriage lengthens. In fact, the wearing away of the gold can symbolise the reverse of permanence – a necessary abrasion as the marriage tests individual metal and stamina at going the course of marriage, enduring as gold cannot.